Berger subsequently lied to investigators when questioned about the removal of the documents, but was soon back in business as a D.C. insider big shot. He eventually became John Kerry's National Security Adviser during his presidential campaign. 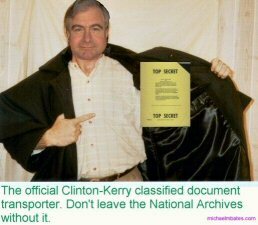 Had Kerry been elected, Berger would have been entrusted with our most sensitive intelligence once again. Now that Kerry is Sec. of State, Berger is probably involved somewhere in the shadows. Elections come and go, but the criminals in Washington are never held accountable. From Berger to Benghazi ...here comes Hillary. Today Sandy Berger sits on the board of trustees of the International Crisis Group with the likes of George Soros, Wes Clark, Kofi Annan and many more. 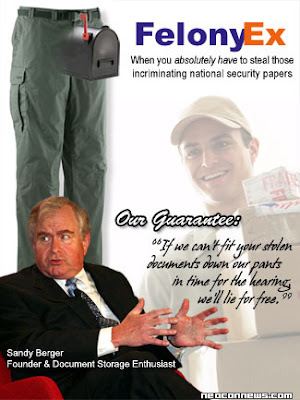 I HEREBY DECLARE this National Remember Sandy Berger Day! Where is a predator drone when you need one? Pants was suppose to surrender himself for a polygraph test...guessing it never happened. I’d carpet bomb the whole bunch of them. Bush’s failure to vigorously persue answers regarding Berger’s actions, and allowing the dems to whitewash the 9/11 report, complete with Jaime Gorelick as one of the lead “investigators”, was the writing on the wall as far back as 2003 that we had elected a democrat with an “R” next to his name. After the 2004 election, Bush gave up with the masquerade and pushed for amnesty, more huge govenment programs and cash givaways, and immense bailaouts, paving the way for the disaster squared we have now. But during that time it was rah rah Bush can do no wrong 24/7 right on this forum. AS soon as Hillary is elected he will be back in the West Wing ...maybe even Sec. of State. Is what Berger did any different than Snowden’s actions?What about Manning? He should be executed in my opinion. seems documents had to do with 911 commission/investigation.